The upper classes of Britain had a relatively comfortable lifestyle compared to those of Roman society who were a lot less fortunate. Until Christianity became the norm as the religion of the Romans, they were pagans who worshipped many gods. As such they did not have holy days or a Sabbath as we do today. Instead their work was a seven day a week event. As trade and industry grew, so the need to work longer and harder became more important. Coupled with the fact that the Romans did not have the effective night lighting we take for granted, they had to work from dawn till dusk. In Britain this was the case as the British winter has days in which there are only six hours of useful daylight available. In the house there would be about twelve people, of which about half would be servants. These 'domestic attendants' would be out of bed before dawn. It was customary for them to live in quarters which were normally two small rooms next to the kitchen and close to the utilities rooms and stores. There were many things to do before their masters awoke. They used torches to light their way while going about their duties. They had to light the fires that supplied the underfloor heating and bring water up from the well. Breakfast had to be prepared and ready for the family when they arose. This was a relatively unimportant meal, the evening dinner being the one where the whole family gather to talk about their day. So Breakfast was often eaten alone. The servants would go about their work in near silence so as not to disturb their masters. To incur the wrath of their employers meant severe punishment. The servants were treated as possessions rather than people, and they could be dismissed from their employment at a moment's notice. It was even legal for their owners to kill them if they so wished. Even so, their lives were better than those who worked in industry, especially the mines. A servant who had built up a good rapport with the masters in a household was often well treated, clothed and fed. They were an asset at dinner parties by preparing impressive meals that enhanced the reputation of the host. Although the Romans were hard task masters, they did reward loyalty and dependable service. About an hour after the servants have started their duties, the family stir. The first to make an appearance is the father. He washes in a bowl of cold water and dresses. He may wear the tunic he slept in as an undergarment, or he could change into a fresh one. Either way, he chose suitable clothing for the day. 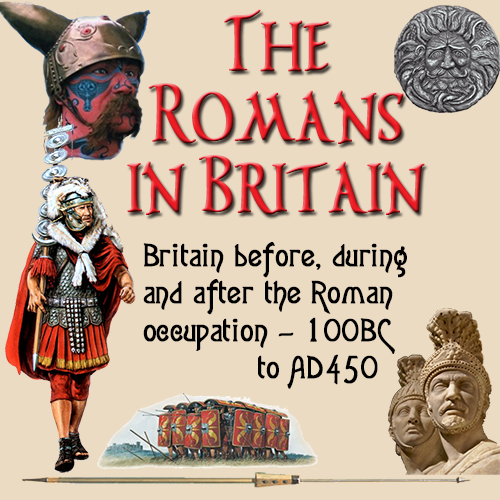 As the Romans spread through Britain, most of the tribal leaders they encountered took to Roman ways and became model citizens. In return they were allowed to keep their status and were even given official posts. So Romans and Roman citizens were both the same in the eyes of the state. Therefore, bona fide Romans and Romanised citizens could dress the same. If he was an official, he would don the classic Roman toga, which was a mark of status in society. Only citizens could wear the toga. Non citizens were limited to a plain tunic. If he was on to have a non formal day, perhaps meeting contacts or friends, he would wear a longer overcoat or robe that resembled a modern day dressing gown. Over this he would have a cloak. The thickness of the material and how many layers of undergarments he wore depended on the weather. A day spent hunting would mean a pair of short trousers that came down to knee level. The clothing would be relatively loose as he would be astride his horse, so tight garments were definitely out. For the lady of the house, the day started in a different manner. She had a couple of helpers to get her ready to face the world outside. First she would wash and dress loosely. There was no point in getting fully dressed yet. She would sit in a wicker chair that had a shoulder high back and secured her in a bolt upright position. While one maid prepared her hair, the other would be removing any wax from her ears with a small stick with a blunt point. Any residue she found would be teased out onto a small spoon the maid was holding in her other hand. When this was finished, the maid would take a pair of metal tweezers and remove any facial hair that was visible. The Romans did not like extraneous hair on the face or the body. Such a thing was considered unsightly and disgusting. At the Romans baths, there were professional hair pluckers whose job it was to remove any unattractive body hair. The only place the Romans accepted hair was on the top and back of the head. Men were allowed beards, but these had to be a full set. Moustaches and partial beards, so called 'goatie' beards today, were considered repulsive. It had to be all or nothing. The hair had to be just right. Times do not change, and even in Roman times there were fashions and styles that came and went frequently. most women of the period preferred to wear their hair in the current style of the emperor's wife. As it took many weeks for news of fashion styles to reach the province of Britannia (Britain), by the time a new style had arrived, the empress had probably changed it. It was common for the lady to have many wigs hidden away to save on the daily hairdressing ritual. Then it was time for the make up. Chalk or white lead for the cheeks, ash or red ochre for the eyelids. Your tresses, Galla, are manufactured far away. You lay aside your teeth at night, just as you do your silk dresses, and you lie stored away in a hundred caskets. Her dresses were made of wool or linen. She too wore a tunic, but this was longer than a man's and reached her ankles. The man was long gone by the time his wife has finished her preparations. He would have had a breakfast of bread and fruit, eaten while mentally planning his day. After giving the servants their instructions for the day, he departed. If he was a town official, he would head to the town hall to begin his daily tasks. A magistrate would spend the day hearing civil cases of divorce, theft and property or land disputes. It is interesting to note that theft was a civil rather than the criminal offence it is today. Other types of officials saw to the administration of the daily running of the town, or managed the collection of revenues and the spending on public projects. For the lady of the house, the day was quite different. After seeing the children off to school, accompanied by a servant, she would instruct the servants regarding the day's meals and any special occasions, such as an evening dinner party she was having. If the children were too young for school, she would spend some time with them, along with the maid whose job it was to bring them up to a level of communication and basic skills ready for their schooling. Then she would probably go to the shops or the market hall with a servant who would be the one to carry any purchases while she went from shop to shop. The servant had to wait outside while she went in a selected her goods. Once she was finished in a shop, the servant was allowed in only to collect her wares. He then had to exit the shop immediately. Later in the day, she may visit a friends house or have some of them around to exchange gossip and discuss the latest fashions. When the husband returned home after a day's work, it was probably still mid afternoon. 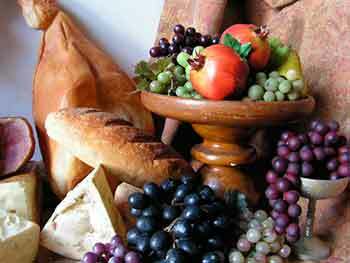 He would have a light lunch of bread and salad with hard boiled eggs or cheese. and fruit. The salad would be served with a fish sauce and wine would be the liquid refreshment. As a last course of the meal, he would have some fruit, which now included the apples, plums along with figs and dates imported from the Mediterranean . He may then have gone to the baths for a couple of hours to talk with friends or get to know someone of high standing in the community who could help his career. Alternatively, the family may go to the theatre of amphitheatre for an afternoon's play. The amphitheatre was mainly a centre for blood sports, but plays, readings and family entertainment were also available there. The evening meal was the main event of the day and the only time the whole family was together to converse and talk about the day. The servants would have been busy for many hours preparing and cooking the dishes. There may be a dinner party arranged which would mean extra work. Alternatively, the family may be attending a dinner party at a friend's house, so the servants would have an easier night. For the standard evening meal, there were three courses, the starter (hors d'oeuvres), the main course and the dessert. Again wine was drunk with the meal, and one drink that was popular was mead. This drink was attributed to the middle ages in Britain, but it originated in, or before, Roman times. Mead was a beer type of drink, fermented from honey, water and herbs. This drink is still available in Britain today, especially in the South-West of England. These were consumed from chalices or mugs that bore inscriptions such 'Bibe', 'Vita' or 'Nolite sitire' the Roman words for 'drink', 'life' and 'don't be thirsty'.